Occupational Therapists (OTs) are allied health professionals who commonly treat people with a variety of medical conditions in order to help them maintain independence in their activities of daily living. Often OTs are required to undertake comprehensive assessments and provide complex interventions in order to help people fulfil their chosen roles in life. Driving is considered a complex activity which integrates the visual, cognitive and physical components of a person. When these components have been compromised from injury or disease then it is often necessary for an Occupational Therapist to intervene in order to determine if a person is safe to drive under Roads and Maritime Service (RMS) guidelines. What does the OT driving assessment entail? At Modified Driving Solutions, we have professionals who are trained and qualified to conduct OT driving assessments under RMS guidelines. An OT driving assessment consists of 2 components: an off road and on road assessment. The driver trained Occupational Therapist will meet at the person’s house. The entire assessment takes approximately 2-3 hours depending on the client’s medical condition. Once completed, the RMS will be notified of the outcome and if necessary, a remediation program will be carried out. The Off Road Assessment is a prelude to the on road assessment. Its purpose is to determine if there are any physical or cognitive dysfunctions that may impact on a person’s ability to drive safely within the RMS guidelines. The OT and driving instructor will then perform the on road assessment and formulate recommendations and feedback to the client. Who will require an Occupational Therapy Driving Assessment? The holder of a NSW driver’s licence is legally responsible to notify the RMS if they have a permanent and long term condition that is likely to affect their ability to drive safely. 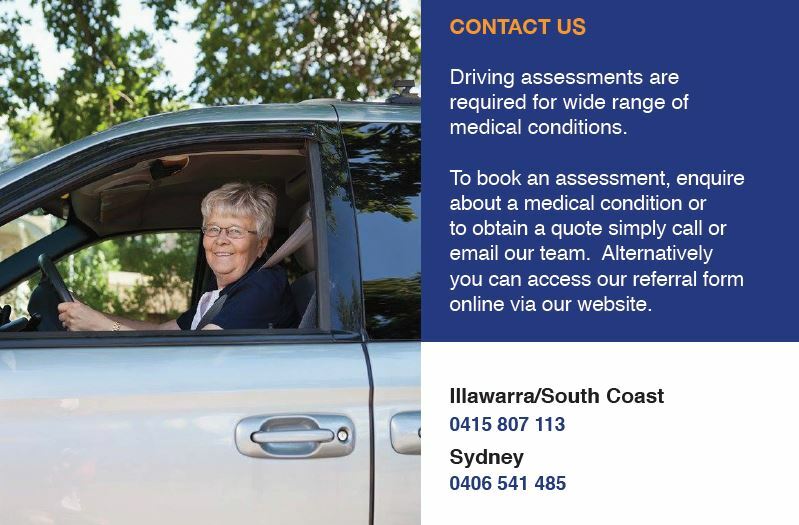 People may be notified by the RMS that they require a driving assessment. Health practitioners may be unsure about how a patient’s medical condition may impact on their ability to drive safely. Health practitioners may also have concerns about reporting patients to the transport authorities, as this may damage the therapeutic relationship. Therefore, it is recommended that the use of an independent specialist, such as an OT, is used to bridge this challenge. Fees will vary depending on the nature of the referral. Client may be eligible for rebates through CTP, Worker’s Compensation or private health insurance.